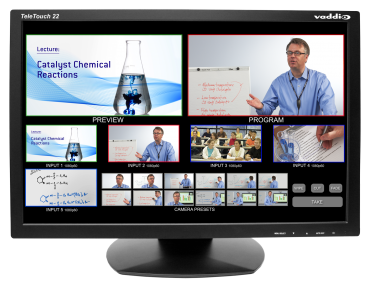 The TeleTouch 22" Touch Screen LCD Monitor with base works in conjunction with the ProductionVIEW HD MV with built-in multiviewer. 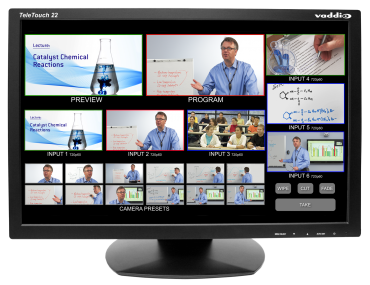 The touchscreen allows all presets and camera positions to be displayed and activated by touching the image itself. 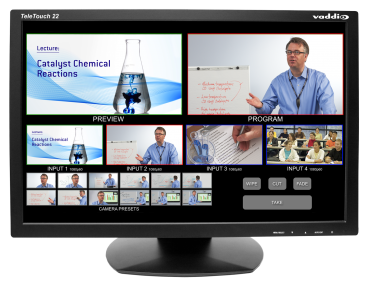 The multiviewer can be configured to display up to six input windows and two larger "Preview" and "Program" windows with red and green tally window borders. In addition, each camera input can have up to 12 stored "video thumbnail" preset camera shots.